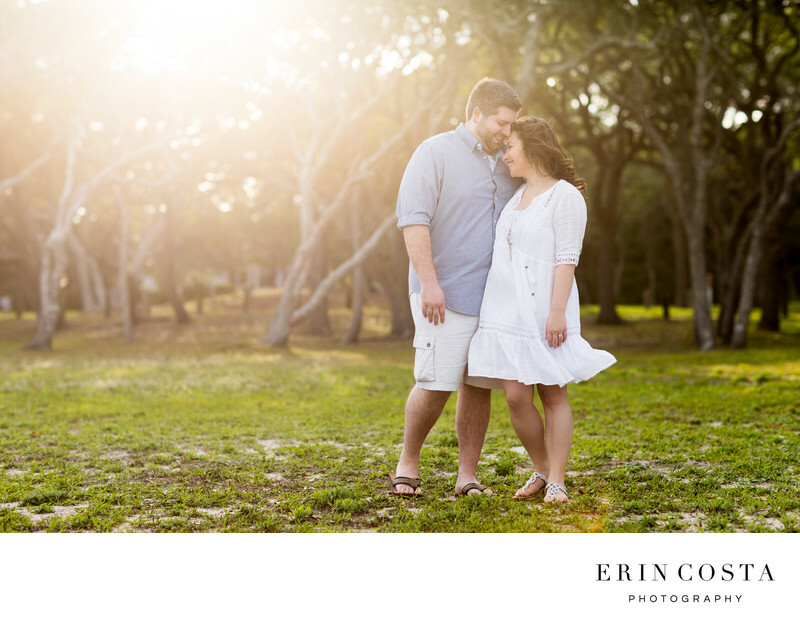 It was a windy day at Fort Fisher, but this couple embraced the wind like champs. After all, a little wind can be romantic right? The sun was setting behind the historic trees, and Chloe and Lou cuddled up together and just enjoyed a moment to themselves. Fort Fisher is a well visited historic site located right outside of Wilmington. Fort Fisher was a Confederate fort during the American Civil War, and it protected the vital trading routes of the port at Wilmington, North Carolina, from 1861 until its capture by the Union in 1865. Along with things to do for history buffs, there is also a great aquarium located there that boasts an albino alligator, a visitor favorite! Not only do we love photographing couples at Fort Fisher, we also love the opportunity to photograph visiting families. The sun sets beautifully behind the historic trees and makes for fun silhouette photos and more. With lots of open space for running around, Fort Fisher is the perfect location for any portrait or engagement session. Location: 1610 Fort Fisher Blvd S, Kure Beach, NC 28449.